*Even though our customer submitted pictures are amazing to look at, there is no guarantee that you will have the same exact results. We are all different and results will vary. Read this page to find out what you can expect: benefits, results, care, application, recovery time, peel cost, possible side effects, acne scar rejuvenation and more. Free Acid Value = 7%, 13%, 20% or 30% *Learn about FAV here. The true antiaging peel. Stimulate collagen, glycosaminoglycans and elastin fibers with a TCA peel*. This is a professional grade "cool-action" (7, 13 and 20) TCA peel with an unbuffered pH of 1.3. TCA is the peel that all other peels are compared to! It has been highly used for decades, is easy to use, and very predictable. Most dermatologists prefer to use TCA over other acids due to its effectiveness and dependability. If you are looking for long-lasting, dramatic changes in your skin, TCA is the correct choice for you. Level 0 TCA 7% (1.3pH) *Extreme sensitivity. Good for crows feet and loose eye hoods. Level 1 TCA 13% (1.3pH) *Beginning peelers looking for more flaking than traditional hydroxy acids. **Best for dark skin. Level 2 TCA 20% (1.3pH) *Have been consistently applying 4-5 layers of the 13 and are looking for more. *1 layer will exfoliate the epidermis to the basal layer. We do not want to go deeper than this. Level 3 TCA 30% (1.3pH) *Warning for diluting, CROSS or body use only. Never a beginner peel. DARKER SKIN - prepare with a melanin inhibitor such as our Fade Bright for 2-3 weeks before your peel. Studies have shown that TCA can be safely used in darker skin types. Safe use of TCA requires longer preconditioning of the skin, a milder strength of acid and strategies for dealing with the likeliness of PIH *post inflammatory hyperpigmentation. Preconditioning includes topical agents such as retinoids or hydroxy acids that will thin the stratum corneum. This accelerates the penetration of the acid into the skin and increases the speed of wound healing - all of which reduce the risk of PIH. In a deeper peel (20% or several layers of a 13%) PIH can develop when the pink stage of healing starts to fade. Sun blocks, heat avoidance, steroid creams and melanin inhibitors can help to reverse this quickly. After 2 weeks, a non-inflammatory type of acid peel such as Salicylic may be used to help treat the pigmentation. Who should be using TCA 30%? Have a desire to use multiple percentages and only want to purchase one product. Dilute to desired percentage (10% - 25%). Want to treat their body. Pigmentation, scarring, mole and skin tag removal and more. The 30% can be used full-strength for these reasons. While we often focus on New cell growth, we sometimes forget that the First step in renewal is Destroying the old, broken down cells! A wide variety of chemical peels are available today for use in office and also at home. Each acid can generally treat more than one type of issue, but is commonly used for a particular reason. TCA is special! It is considered "the gold standard" of all peels and is able to treat every skin type, issue and coloration. It can be used superficially in very mild percentages (10%-20%), and also for medium depth peels (up to 35% *Office only). It can be used in combination with other acids, such as Jessners or applied alone. All skin types can benefit from TCA peeling. But, persons that are prone to post-inflammatory hyper-pigmentation, or have a naturally darker skin tone, will need special pre-treatment to avoid any unintended color changes in the skin. These are generally fitzpatrick 4, 5, and 6, but any type could potentially have an issue. DARKER SKIN - prepare with a melanin inhibitor such as our Fade Bright for 2-3 weeks before your peel. This is available on this page as an "Additional Option". Hydroquinone, Alpha Arbutin or other melanin inhibitors should be used 2x per day for at least 4 weeks to significantly reduce the likelihood that PIH will develop. *It is not guaranteed to eliminate it, just reduce the likeliness of it happening or reduce the rate that it does occur. We highly recommend the use of Fade Bright and offer it as an Option on all our TCA peels. If you are still unsure of your Fitzpatrick type you can take a Quiz at SkinCancer.org to find out. Melasma: Many dermatologists prefer using TCA peels to any other modality for treating melasma, usually in combination with prescription creams. The cost generally ranges from five hundred to fifteen hundred dollars per peel, depending on how deep the peel is, the region you live in, and your doctor. We are offering you an at-home alternative to these expensive treatments, but a word of caution. TCA is caustic. We prefer that you apply more layers of a lesser percentage (such as the 13% at 2-5 layers) as opposed to a single layer of a high percentage such as the 20%. Never move up to the next percentage until you are applying five layers of your current percentage (5 minutes in between layers) and feel that you are ready for more flaking. Exercise caution for the best, most predictable results available. TCA peel outcomes are very predictable, and under the proper instruction, milder percentages can safely be performed in the home. They key to an excellent, professional outcome is 1.] adhering to the pre-treatment protocol, 2.] understanding the application method, 3.] providing the proper post care, and following each item precisely. *If you are prone to fever blisters, the acid can cause a breakout. Prescription medications must be used before a TCA peel is applied or the breakouts could cause scarring. Follow our Pre-Treatment Protocol to get the best results from your TCA peel. Begin and End each day by washing with a pH acidic cleanser. *Our Revitalizing Glycolic Cleanser is perfect. If you have darker skin, or are dealing with hyperpigmentation/melasma, pretreat 2x per day with a tyrosine inhibitor such as our Fade Bright. After cleansing, apply an anti-oxidant such as High Octane Vitamin C serum. Protect skin with an SPF of at least 30 before going outdoors. Each evening gently thin the stratum corneum layer by applying a layer of Vitamin A, such as our Retinol .10, .20 .30 or .50 Luminosity. Alternatively, you may use the Glycolic & Hyaluronic Serums to perform a similar function. TCA will improve color, freshness, texture, skin tone, and fine wrinkles. It will also improve superficial discoloration, such as age spots. It may improve blotches and can sometimes improve dark circles under your eyes. TCA is a natural 2nd step when other acids stop producing benefits and is one of the FIRST suggestions we will suggest to you for cystic acne issues. Applying a chemical peel is as straightforward as applying a toner to your skin. With TCA though, we need to control the amount of acid on our applicator. Here at Platinum, we prefer a gauze pad as it will not soak up and waste extra solution. Here is a brief application example. *You will receive our Peel Manual with purchase which has detailed instructions. We also have a downloadable direction sheet here. A TCA peel gets its strength from being applied in multiple layers. A layer is a single application of the acid during a peel treatment. Multiple layers will be applied to progress the peel deeper into the skin - without washing off any previous layers. ** If this is your first time applying OUR TCA we suggest applying only 1 layer. You can then strengthen the peel with additional layers as you move forward in the process. *30% will never be layered. A dripping, heavily saturated applicator will lead to unintended results. Instead, do the following: Pour a small amount of solution into a medicine cup. Fold your gauze pad in ½. Dip into solution. Fold pad in ½ and give it a squeeze. Ready! Thoroughly cleanse all areas to be peeled with a deep cleanser. Wipe Prep B on all areas to be treated. 90% alcohol may be substituted. Apply first layer of TCA peel solution. *30% will never be layered. Wait approximately 3-5 minutes *(the proteins in the skin coagulate, then the acid self-neutralizes). Decide if more layers are necessary. Some areas are white and some are not? You may apply another coating of acid to areas that are NOT white. Apply Luminosity Method for extra regeneration and peeling. 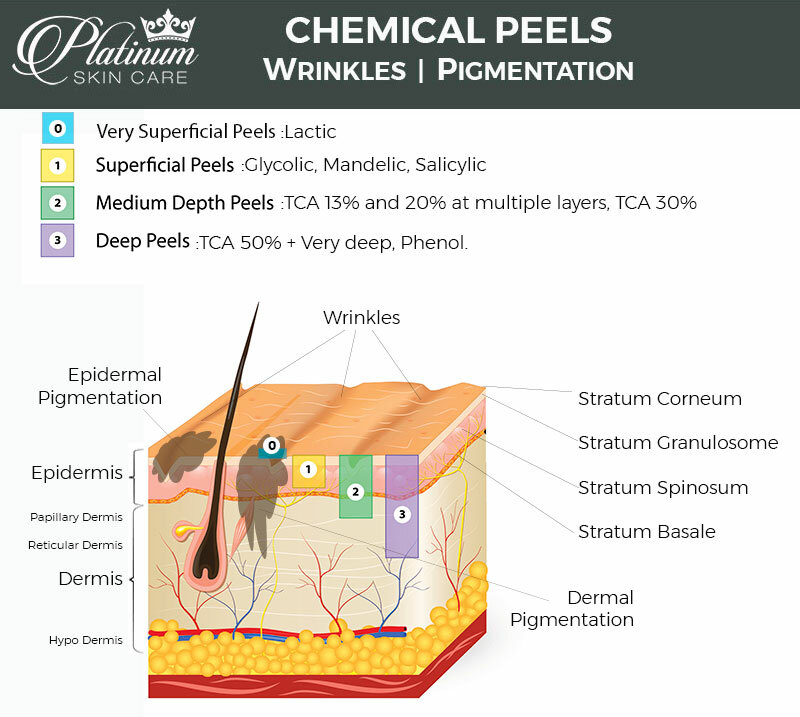 What makes our TCA Peels better? Watch and learn. TCA peel application. This is a diluted percentage. If you are interested in applying TCA onto your eye area, see our TCA Eye Peel applied here. We have a wonderful Eye Peel Kit available for you as well with our Matrixyl 35% Synthe'6 Potion and our Luminosity .50%. So, what about men... can they safely apply a TCA peel as well? Absolutely they can. Most men have a thicker skin than women, so they will be more comfortable during the peel process. We highly recommend that you do NOT shave for 2 days prior to applying a chemical peel. This is because shaving is actually a means of exfoliating, and some of the skin will be removed. This makes your chin and mouth area more prone to a deeper peel than the rest of your face. Embrace your 5:00 shadow and have a safer peel. Here is a great video from a male client of ours in France. He used a 20% TCA and got intense frosting and a very deep peel with LOTS of flakes. Note** Do NOT just peel at the flaking skin. He did the peeling as a dramatic effect for the video only. Use a small manicure scissors and trim the skin off instead. Keep in mind that this video was over a course of around 10 days. His skin shows dramatic improvement - and this is only his first peel. It will get even better once he completes his peel series. With a 20% he should be doing no more than 1 peel every 2-4 weeks. How deep can a TCA peel penetrate in your skin? The TCA acid can penetrate quite far. It is considered a medium depth peel due to the fact that with multiple layers, it can reach down into the epidermis and even a bit into the upper Papillary dermis. This is beneficial for many skin issues such as pigmentation, fine lines and scarring, since they tend to run as deep. Regular hydroxy acids can not penetrate past the Stratum Corneum, so they are considered more of a Superficial peel, very superficial peel, or just an Exfoliation. There is no magic system to heal quickly after a TCA peel. It will generally take around 1 week. We are purposely creating a controlled burn to stimulate tissue regeneration. There is a process your skin will move through. On the first day of your peel your skin will be tight, smooth and possibly a little bit pink. Keep skin hydrated with emu oil/hyaluronic or another moisturizing product. Within the next 2-3 days your skin will be tighter and could feel dry, *possibly darker on surface areas. Wrinkles/lines may look more prominent as the skin is preparing to come off. Depending on the percentage of acid you applied, and the amount of layers, you will start to see flaking on days 3-4. Flakes will begin on the areas of your face that are in motion such as around the mouth and nose. It will take another 3 days or so for the flaking to stop. Never pick and keep moist. Debate. Dry or moist skin during healing? There are conflicting opinions all over as to whether or not you should allow your skin to dry up (thought is that it's better for peeling) or you should hydrate it (fact). Along with dermatologists, we recommend that your skin always be hydrated. If you were to allow your skin to be dry you run the risk of excessive itching or a possible tear as you move your tight skin. Dry skin will give extra tiny flaking. A hydrated face will not only feel more comfortable, but the flakes will come off in larger, more manageable pieces. Hydrating will not slow down or change the effects of a peel. Some flaking you will see and some you will not. Take a moment to look over our TCA peel pictures at the top of the page. They will give you an idea of what the peeling can look like. They are all labeled to show percentages, layers and any extra applications. What kind of peeling can I expect with a TCA peel? The variations are huge, as TCA is such a customize-able peel. *This is the great draw for most people as they can have a mild peel or a deep peel with the same acid and even percentage! Everyone should begin with the 13% and not move up until you are unhappy with a 5 layer peel. That is the ONLY reason to ever move up in strength. *Never get a 20% just because you want to "peel more". It is the layers that cause the flaking. TCA 7 - 1 layer: You will get very, very light flaking. No frosting at all to be seen during application process. Very mild feeling. Tingle or itchy. TCA 13 - 1 layer: You will get very light flaking. Barely noticeable flakes that are super easy to manage. Probably no frosting at all to be seen during application process. Very mild feeling. Tingle or itchy. TCA 13 - 2-3 layers: Definite flaking for 3-4 days. No browning, just a bit of a crinkly look for a few days. Maybe a few spots of frosting here and there. Cheeks, forehead and nose area are possibilities. Tingles at each layer, could feel a bit of stinging depending on sensitivity for a few minutes. TCA 13 - 4-5 layers: This would be a deeper peel. You would see frosting during this application process and will feel stinging on layers 3-5 that will gradually go away by the end of the 5 minutes between layers. Most likely a little bit of browning in the outermost layers of dead skin. *It turns brown because the skin is no longer attached. It is truly "dead" and will peel off. *If you have had an obaji peel (which is 3-5 layers of a 15% or 20%), or have used 13 at 5 layers consistently, then you are ready to move up to 1 layer of the 20%. Be cautious depending on your Fitzpatrick number. Always prep with Fade Bright or Hydroquinone prior to a high % TCA peel for a minimum of 2 weeks to help avoid (or greatly diminish) post-inflammatory hyperpigmentation. Any chemical peel can give undesired outcomes. That is why preparing the skin prior to a peel is always your best defense. To make sure that you minimize any possible complications, follow protocol. PIH - Post inflammatory hyperpigmentation happens when the skin becomes inflamed/damaged/wounded. The epidermis stimulates melanin synthesis and a brown patch will remain after healing. A common example is a dark spot after the inflammation of a pimple is healed. This PIH generally takes several weeks to months to fade. By applying a broad spectrum SPF of 40+ daily, a daily antioxidant, Retinol Vitamin A, and a fade gel daily this outcome can greatly be minimized or avoided entirely. Results will always be best when combined with an at home regimen. Scarring - Scarring after a chemical peel is not very common. If you are among those that have a history of keloidal scarring, you would be best to avoid peels in general. Stick with a topical acid serum or Retinol instead. Redness - A continued state of redness is not common with a lower strength TCA acid. This is more common with a Phenol peel. Infection - The TCA itself will not cause an infection, but if you are Herpes simplex positive, the peel irritation itself could cause an eruption then infection. Use an acyclovir prescription prior to any chemical peel application. Have You Been Looking For A Vitamin A Peel? **Well, we have you covered! Advanced and professional peeling methods are our specialty. Choose to add on our Luminosity Method for a spectacular multi-level Vitamin A peel. The dual applications will increase your peeling and enhance your skin's tissue regeneration! Full instructions on how to apply our Luminosity Method are included in every peel booklet. Don't forget to add on our Luminosity cream with your order though, (just select the "Luminosity add on" prior to putting your peel into the cart) to super-charge your next regenerative peel. Anti-Aging to the extreme. Since burning, irritation and stingy itching sensations are not qualities people love to deal with, we have added something extra special to this peel. Our Cool-Action is a refreshing additive that will make this THE MOST COMFORTABLE TCA PEEL you have ever had! Our additive will help to minimize the 'burning effect' that many people feel while working with stronger acids. This ingenious action allows for a more comfortable peel for you. Perfectly strong and perfectly comfortable. You will also find this in some of our other more "irrirating acid" peel formulas. *The 30% does not contain menthol due to its different dilutant base. TCA is one of the most famous, long tested acid peels available. TCA stands for trichloroacetic acid. It is a medium depth peel that has been used with excellent results for over 135 years! That is right. TCA was actually first used as a peel by German dermatologist Paul Gerson Unna back in 1882. He also worked with salicylic acid, resorcinol and phenol. TCA is very commonly used now due to its excellent track record for being very predictable. TCA can be easily adjusted to any depth needed to address common skin imperfections. For example, someone needing only minor epidermal improvement, a single application of 10%-15% would be effective. On the other hand, if the problems are deeper in the dermis, a stronger solution or more layers can be applied to reach the issue. will increase the depth of the peel. The percentage does not make the peel move deeper - it is the LAYERS of solution or VOLUME of solution that cause the penetration. We can explain this by teaching you how TCA actually works. TCA's mechanism is different from regular hydroxy acids that just dissolve bonds. Trichloroacetic acid coagulates the dermal and epidermal proteins in the skin, then "shuts off". So, the more solution that is applied, the deeper the acid will go looking for protein to neutralize itself. If you put on many layers it will keep digging. If you put on a heavy amount of solution (face is too wet), the acid will continue digging until it can neutralize all of the acid. *This is why we are very careful in our Peel Manual to teach you to squeeze out your gauze pad prior to applying acid. We don't want too much acid on at any one time. Everything is here for you. What makes our TCA peels the best and why they are going to work for you. They are Certified - pH Guaranteed - % Guaranteed - Have Cool Action and are used in Spas and Dermatologist's Offices all over the country as professional treatments costing up to hundreds of dollars per treatment. They are as comfortable as they can possibly be and are simple to use. We have also included a detailed Direction Booklet that outlines all of our peels, alternative application methods, complete skin prepping and after care recommendations. If you are dealing with acne, pigmentation issues, rough skin texture, wrinkles, scars or just want to look refreshed and amazing, start peeling away the years of neglect now. After a few treatments you will wonder why you ever waited so long to use a Platinum Skin Care TCA Peel! It's time to revisit the top of the page and choose your percentage. While you are up there, take a look at some of our TCA peel pictures! Are you still thirsty for more skin care knowledge? We are here to help you with TCA peels, skin care regimens and every other product sold on our website. Please pick up the phone and Call us (M-F 1-800-917-3155 9-5 EST) for personal help. You may also send us an email or Chat with us during business hours with the chat box in the lower right corner. Take a few minutes to read over our piles of Testimonials. There are two groups of them on this page and also a side tab (green) where you can scroll through and see the positive reviews of all Platinum Skin Care products. Read on to learn about layers, watch a TCA CROSS Method video, and learn more details about our exceptional TCA peels. *If you have arrived at this page from the recommendation of our French Blogger, Follow recommendations above and do NOT choose the 30%. TCA 30 is far too strong for a full facial peel. Only purchase this if you are planning on diluting it. Always begin with the 13%. Si vous êtes arrivé à cette page de la recommandation de notre Blogger français, Suivez les recommandations ci-dessus et ne choisissent pas les 30% . TCA 30 est beaucoup trop forte pour un peeling facial complet . Seulement acheter si vous avez décidé de le diluer . Toujours commencer par les 13%. TCA peel is a great acid to use when treating scars. As you break down the scar tissues and stimulate the growth of replacement tissues, you can move things along even faster by incorporating a Copper Peptide into your revision regimen. You can purchase a complete scar kit with TCA here, or you can just go directly to our copper page here. Take a moment to watch Dr. Moscato perform a TCA CROSS in her office. Notice that she is using a saturated pick and not allowing it to drip on the normal skin. She is very precise with her pressure. Watch her technique and see what you can expect while performing this method at home. *Never, never use a TCA with a higher percentage than the 30% for this method. A higher percentage will burn a hole through your skin. Now, watch our CEO perform the TCA CROSS method and give you detailed information about which acne scars can be helped with this method as well as how you are going to apply it at home. Prep, application and post care are all described in detail. Dermatologist Dr. Dray explains how the TCA CROSS Method works in depth. The TCA CROSS method is a combination of needling and acid to break down scar tissue and stimulate the growth of new collagen to fill in depressions. We recommend the 20% or 30% for this method. Scar revisions are usually coupled with Copper Peptide Remodeling Cream (or serum) to promote more rapid regrowth. The CROSS method can be done only 1x in a 5 week period. *Full directions included in your Peel Manual. Soak wooden pick in peel solution. Apply solution to interior of scar with medium pressure. Watch for frosting on rim of scar. Apply copper and emu oil to aid in remodeling. Are you unsure if TCA is the right acid for you? Since acids have multiple uses, it can be difficult to make sure you are choosing the best acid for your situation. Don't be unsure. We are here to help you. Give us a call and we can walk through what you have been using and also what you want to accomplish. Once we figure out your exact needs, we can get you into the correct acid and also percentage. If it is after business hours (M-F 9-5 eastern) then you can watch our helpful video (below) to learn more about the acids and their uses. You can also visit our Everything You Want to Know About Chemical Peels Page for detailed and helpful information regarding all of our peels - including TCA. TCA peel on the body. Watch a comparison of TCA 30 and Glycolic 70 on the hands and arms. TCA 30: Purified Water, Trichloroacetic acid, Propylene Glycol, Citric Acid, Lactic Acid, Sodium Lactate, Glycine, Fructose, Urea, Niacinamide, Inositol, Sodium Benzoate, Benzyl Alcohol. pH 1.2 - 1.4. Luminosity: Purified Water, Caprylic/Capric Triglycerides, Squalane, Cetearyl Alcohol, Glycerin, Cyclopentasiloxane, , Sodium Acrylate/Sodium Acryloyl Dimethyl Taurate Copolymer, Retinol, Cyclotetrasiloxane, Glyceryl Stearate, Aloe Barbadensis Leaf Extract, Phenoxyethanol, BHT, Caprylyl Glycol, Hexylene Glycol, Citric Acid. *California residents: This product This product can expose you to TCA (INCI: trichloroacetic acid). You may still purchase this product by agreeing to our Shipping Policy during the checkout phase. TCA 13% peel applied by Glama. One layer on entire face and a 2nd spot treated on pigmentation and areas that did not frost. *Latino skin. She did the proper pretreat with Fade Bright for 2 weeks before performing peel. Here is another first time peeler. Enjoy beauty Vlogger Kim Hammon and her TCA 13% application. Here is another new customer applying the TCA 13% in 2 layers. GREAT CHOICE. I am AA with medium brown skin that has pigmentation problems. My skin is normally resistant to anything over the counter. But this peel is great! I have only progressed to 3 layers, but that's all I have ever needed. I go from application to completely peeled in about 7 days. The 13% resurfaces my skin nicely with no burning, scarring, or discomfort. Its strong enough to do the job and will keep using this product for quite some time. *Results vary depending on individual needs and product usage. Please see us for personal recommendations. TCA 13% chemical peel TRY IT! I purchased this a while ago but was afraid to use it because of the anticipated downtime. I bought glycolic acid and lactic acid peels instead and used them periodically. I have been using Retin A micro 4% and finally tried the at-home TCA 13% - just one layer. I didn't have any frosting and found the application to be less stinging than the other two types of peels that I had used in the past. Maybe the menthol in it makes it feel more like a freeze/burn. I also found an alternative, somewhat unorthodox use for this product. I used it to peel off my daugher's planters warts, dapping it on once or twice a week after soaking her feet. It worked well for that. The salicylic acid peels would probably also work well or better. *Results vary depending on individual needs and product usage. Please see us for personal recommendations. ITS WORKING! I started with the lighter glycolic peels and worked up to this one. It's a mess to deal with while it's actually peeling, but I am seeing my acne scarring and skin discoloration beginning to fade! It is definitely worth a little inconvenience. If you're thinking of trying thisproduct, please stick with it. It's not an overnight "fix", but it does work. I've been using Platinum Skin Care's products (skin care & peels) for about 8 months now and am very pleased with the results. I'm thrilled to have something I can do at home. *Results vary depending on individual needs and product usage. Please see us for personal recommendations. LOTS OF BANG FOR YOUR BUCK! I've used glycolic peels for a few years and finally mustered up the courage to try TCA. I started with the 13% and diluted the solution with water, 1:1 for the first peel. I've done 4 peels spaced 7-10 days apart, all diluted, and have gradually increased the strength with each peel. I'm up to about a 9% solution and my skin is loving every minute of it. For the last two peels I've experimented with applying 2 layers of the diluted solution. This approach has resulted in some really positive changes to skin tone, discoloration, and wrinkling. All with very little redness, no frosting, minimal discomfort, and no down time. I'm smitten with this product! *Results vary depending on individual needs and product usage. Please see us for personal recommendations. Customer service has been stellar! Their was not a question I had, unanswered.Being a first time customer I was pleased with the texture change in my skin after just one face peel.I'm very excited to see the finale results! Thanks so much, Steph* *Results vary depending on individual needs and product usage. Please see us for personal recommendations. Helen, 12/28/14 A must try product! I'm so blessed and thankful for this absolutely great company. I plan to do one more tca peel with two or three layers. So i will update everyone on that experience: ) *Results vary depending on individual needs and product usage. Please see us for personal recommendations. Fantastic as always! We have been ordering from you for years although your records may not show this; I had too sign up again due to the changes on the site! Great service, quick delivery and incredible products! *Results vary depending on individual needs and product usage. Please see us for personal recommendations. BEST SKIN REFRESHER I KNOW OF! I have been a TCA user for 10 years. I HAD thick, oily, sun-scarred skin. After my first peel, my skin was luminous, less oily, and the scarring had virtually disappeared. In my opinion, TCA should only be used by someone who has experienced the process professionally so they know what to expect. I have been doing my own peels for the past 5 years on both my face and the back of my hands and there is nothing that makes my skin look fresher or more youthful. I highly recommend it. *Results vary depending on individual needs and product usage. Please see us for personal recommendations. ;) If you are still starved for more information, click on over to our Everything You Ever Wanted To Know About Chemical Peels page ... or, head to the top and make your selections. While we often focus on new cell growth, we sometimes forget that the first step in renewal is destroying the old, broken-down cellular machinery. TCA Peel Application and Entire Peeling Process! Collab With Jenifer Jenkins! TCA Chemical Peels...My SHOCKING Experience!! Get RID Of Chest HYPERPIGMENTATION & Sun Damage!